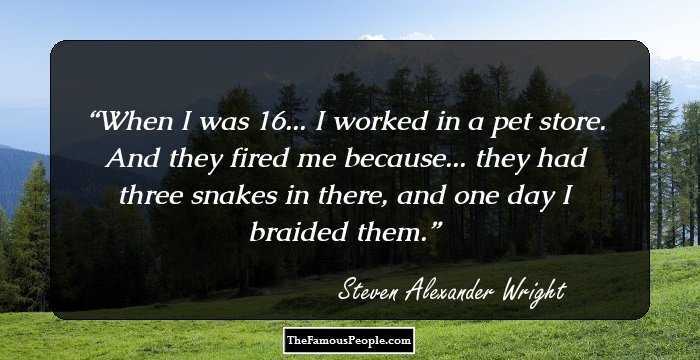 A collection of quotes and thoughts by Steven Wright on humor, walking, memories, past, think, fishing, writing, idiot, funny, desert, people, mirror and experience. 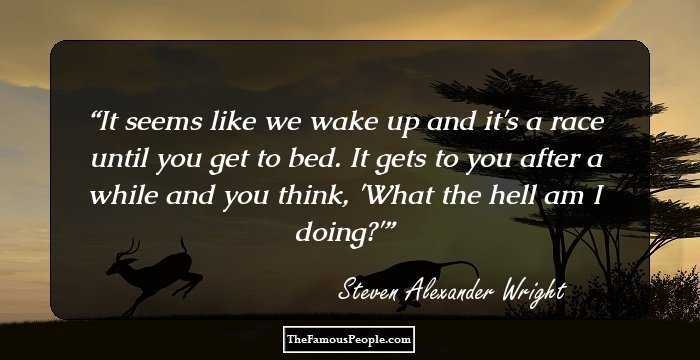 Steven Alexander Wright is an Oscar-winning American film producer, comedian, actor and writer. Wright is renowned for his distinctly slothful voice, and unrushed delivery of philosophical, sometimes nonsensical, cryptic and ironic jokes, anti-humor, satirical one liner. ‘Comedy Central’ listed him at the twenty-third place in the list of ‘100 greatest stand-up comics’. Besides being a comedian he is also a musician and has recorded various non-comedy songs. Some of the Wright’s famous discography includes, ‘I Have A Pony’, ‘I Still Have A Pony’, ‘One Solider’ and ‘The Appointments of Dennis Jennings’. 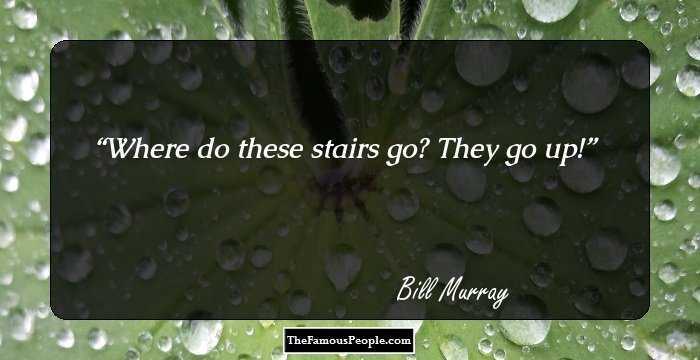 He became the first inductee to the ‘Boston Comedy Hall Of Fame’ in 2008 and was nominated twice for ‘Emmy Awards’ besides bagging in the ‘Academy Award’. 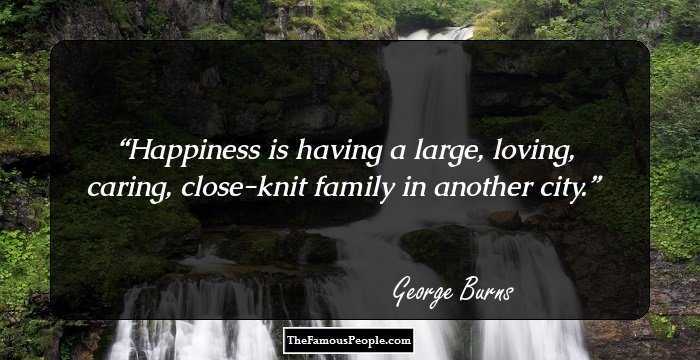 We have gathered some funny one-liner, thoughts, views and opinions by the renowned artist which is quoted extensively. 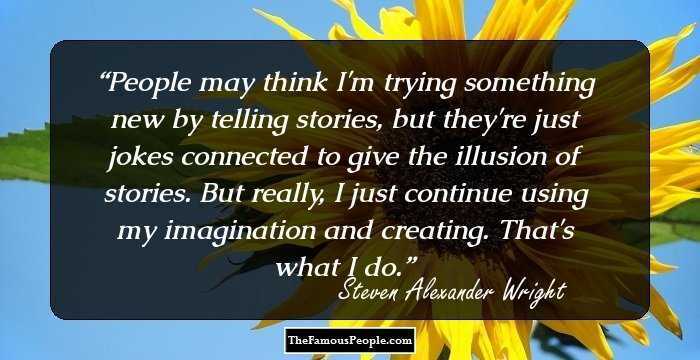 Read through the inspirational, humorous and ironic quotes and sayings by Steven Wright. 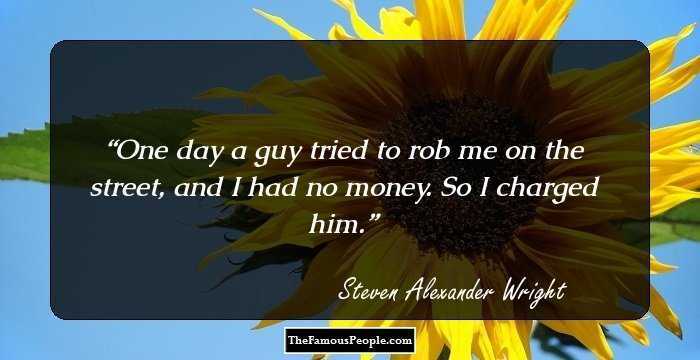 One day a guy tried to rob me on the street, and I had no money. So I charged him. 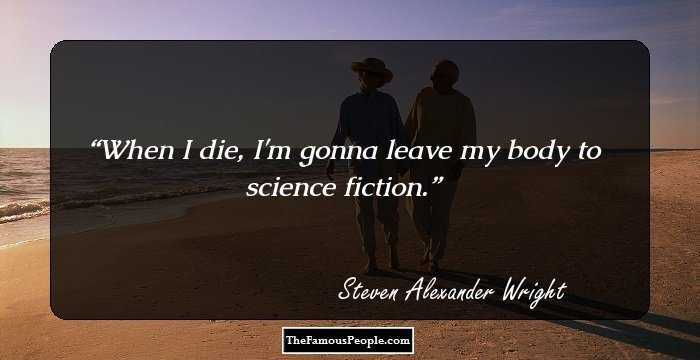 When I die, I'm gonna leave my body to science fiction. I always thought Johnny Carson was just brilliant, and I used to watch him and all the comics that would be on the show every night - and I'd dream about it being me. I thought I would be a guy on the radio. My act is an exaggeration of a part of me. I'm much more expressive off stage. It usually helps me write by reading - somehow the reading gear in your head turns the writing gear. I have all the emotions that everyone has; it just appears that I don't. Only one in four jokes ever works, and I still can't predict what people will laugh at. I didn't tell any of my friends that I wanted to be a comedian, because I was superstitious. I thought if I told people, it wouldn't happen. So I kept it all in my head for years and years. I haven't changed at all. I'm the same as when I was 11. At one point he decided enough was enough. I got this powdered water - now I don't know what to add. You know those things that you throw the twigs into and it spits them out? That's what I do. The branches are like life, and I throw them into my head and some of it comes out as humor. I don't like politicians, and I don't like politics. I definitely don't want to be associated with any of them. Real life? Well, I just hope mine isn't investigated. They might find that I don't really exist - that I'm just a hologram. I'm going to get an MRI to find out whether I have claustrophobia. 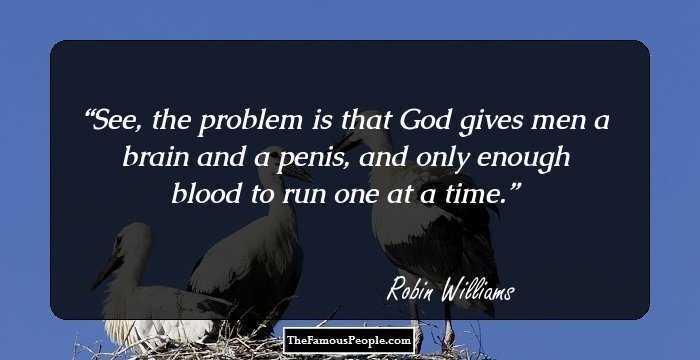 What I like about the jokes, to me it's a lot of logic, no matter how crazy they are. It has to make absolute sense, or it won't be funny. To the audience, it's like I'm changing the subject every five seconds, but to me, my show's almost like a 90-minute song that I know exactly. I wrote every note, and I know exactly where everything is. Comedians are sociologists. We're pointing out stuff that the general public doesn't even stop to think about, looking at life in slow-motion and questioning everything we see. I need one of those baby monitors from my subconscious to my consciousness so I can know what the hell I'm really thinking about. Good jokes are gems. A good idea is hard to come by. I couldn't give them to someone else, even for money. It just wouldn't seem right. So, do you live around here often? Like other kids wanted to become firemen or astronauts, I wanted to make people laugh. The other day I... uh, no, that wasn't me. I was arrested for lip-syncing karaoke. I laugh all the time - at things, people, stuff, whatever. But, I don't laugh onstage because then it's serious business. I feel lucky that I can have people laugh solidly for a whole hour by just saying what I think and getting paid for it. 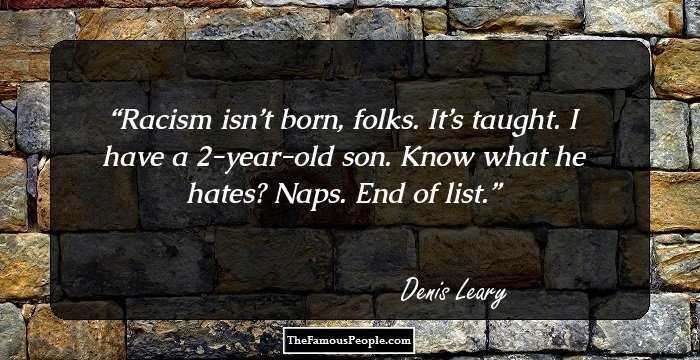 I like George Carlin's jokes. I like his humor. 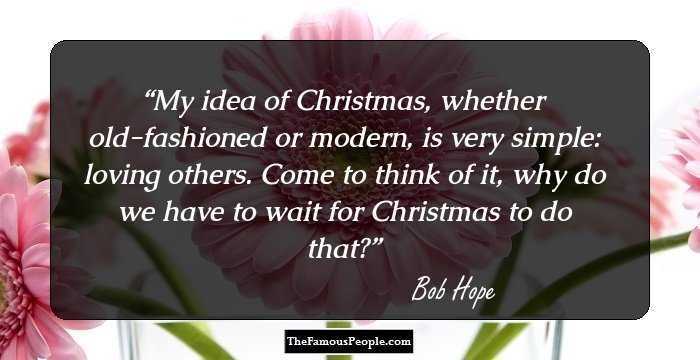 He's one of my heroes, and I like what he did with talking about everyday things. Be nice to your children. After all, they are going to choose your nursing home. My favorite book is anything by Kurt Vonnegut - he's my literary hero. I got to meet him several times, which was a great thrill for me. I don't really remember what we talked about. I went to a general store but they wouldn't let me buy anything specific. I don't go off and sit down and try to write material, because then it's contrived and forced. I just live my life, and I see things in a word or a situation or a concept, and it will create a joke for me.